Come prepared with small gifts to hand out to the winners of Bridal Bingo. If you are throwing a bridal shower, you are likely thinking about ways to entertain the guests. 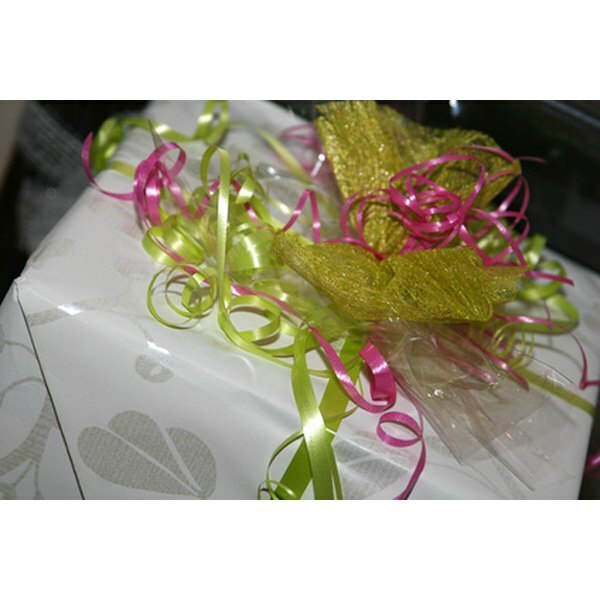 A bride often receives dozens of gifts, and the process of her opening them while everyone watches can be a lengthy one. Playing Bridal Bingo is a fun way to keep your guests from growing bored. It is simple and quick to customize your bingo cards online. Hand out the printed cards to each guest, and designate someone to assist in calling out the words and distributing small gifts to the winners. Visit the Custom Shower Bingo website. Click "Build Bingo." In the drop-down menu, select either "Bridal Shower Gifts" or "Wedding Theme." For the Bridal Shower Gifts version, the bride-to-be opens her gifts while the guests match their bingo squares to the gift. The guest shouts "Bingo!" once five in a row have been crossed off. The shower host hands out gifts to the winners. Play the Wedding Theme version in regular bingo style. A caller picks from the predetermined list of words and calls them out. Enter any words you wish related to the gifts or wedding and click the "Add Word" button. To customize the list further, click the "X" to the left of any or all of the words, and replace them with your own until the list is full. Click "Next" when the list is full. Choose your preferred color in the drop-down menu, and click "Next." Choose your font; click "Next." Click the link to print your bingo cards. Refresh your browser to shuffle the words in your word list.